Preface (A. Abell). Combinatorial synthesis of peptidomimetics (O.B. Wallace et al.). The development of novel noncovalent thrombin inhibitors (T.J. Tucker, R.C.A. Issacs). Ppetidomimetics designed for oral absorbtion (G.M. Pauletti). Rare protein turns: &ggr;-turn, helix-turn-helix, and cis-proline mimics (F.A. Etzkorn et al.). Design of non-peptide agonists and antagonists for neuropeptide receptors (D.C. Horwell et al.). Amino acid mimetics and design of peptidomimetics for opoid and melanocortin receptors: general perspectives (V.J. Hruby, C.A. Slate). Peptide nucleic acids: potential as antisense and antigene drugs (A.B. Eldrup, P.E. Neilsen). Solution and soluble polymer synthesis of azatides and azapeptides (J. Yoon et al.). Sugar amino acids and carbohydrates as scaffolds and peptidomimetics (E. Lohof et al.). 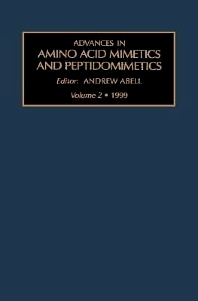 Peptidomimetics have found wide application as bioavailable, and often potent mimetics of natural peptides. They form the basis of important classes of enzyme inhibitors, they act as receptor agonists and antagonists, and they have even been used to mimic DNA structure. Recent advances in the use of solid-phase organic synthesis have paved the way for the preparation of libraries of these structures to allow the rapid optimization of theri biological properties and hence therapeutic potential. We are also beginning to gain a greater understanding of the structural features of this class of compounds that influence their ability to permeate membranes, and their rate of clearance and metabolism. This volume brings together many of these critical issues by highlighting recent advances in a number of core peptidomimetic-based research.